A Japanese contact lens manufacturer, which is famous for beautiful colour contact lenses even among Japanese celebrities, launched the second Hello Kitty contact lens in violet last month. Gaining a great popularity among women with the previous two series, the company announced that they will be offering pink ones next month! I assume you are interested to see how it looks like? It has got kitties with little hearts around them! I couldn’t get a picture, but here is a movie of the contact lens! This pink one can only be purchased when you regularly purchased contact lenses from the manufacturer for 6 consecutive months, and a pair costs 5,800 yen (US$58). FYI, in addition to this kitty series, this character series also have my melody with flower patterns in blue in the same price range. 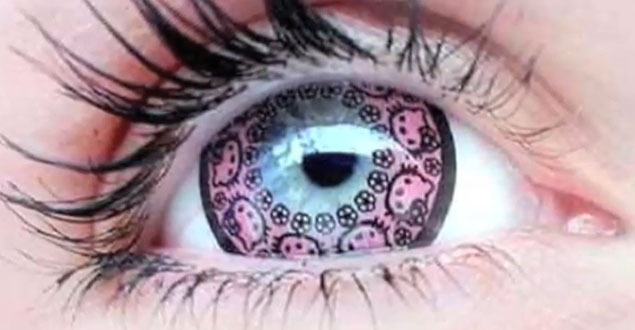 Who those who are bored with normal colour contact lens, this could be a unusual, cute options? ?